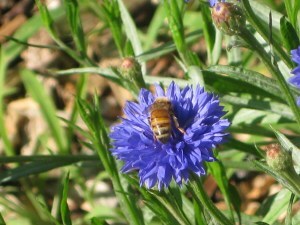 Bachelor Button. 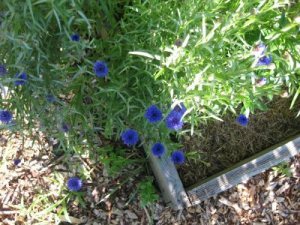 Eight weeks after planting, the Bachelor Button, or Centaurea cyanis, produces dozens of deep-blue blossoms on willowy, gray-green stems. 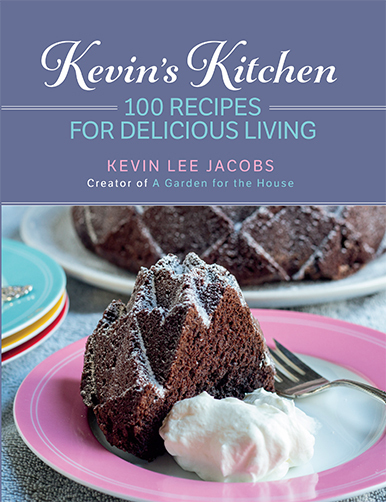 The flowers are ideal for cutting. Full sun, average-to-dry soil and regular deadheading are the three requirements that guarantee a parade of blue from late June through frost. Bees and butterflies love Bachelor Buttons, too. Delphinium. You can count on the blue spires of delphinium to bring sheer elegance to even the simplest of gardens. They are particularly effective in front of yellow ‘Graham Thomas’ roses, or in a border, placed behind pink asiatic lilies. A formal bouquet of fragrant pink ‘Star Gazer’ lilies, white astilbe and blue dephinium is nothing short of divine. ‘Blue Mirror’ delphiniums grow in the back of my cutting garden, in a raised-bed that receives afternoon shade. The plants do not last long in my hot and humid northeastern garden, but I don’t mind. I treat them as annuals, and buy new ones every year. Moist, well-draining soil is vital to success, and the plants must be staked early on. Cranesbill Geranium. 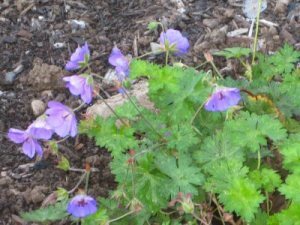 A more traditional plant with violet-blue flowers is the lovely cranesbill geranium, ‘Roseanne.’ Years ago, this geranium hybrid made a stunning groundcover for one of my rose-beds. Now, it sprawls merrily beside the dwarf lilacs in the Serpentine Garden. The plant is perennial at least to zone 5. Cranesbill flourishes in any well-drained soil. Cut old flowering stems back to the ground for continued bloom from June through frost. Blue Pimpernel. Anagallis monelli “Blue Light’ is currently under experiment here; I have it in a sunny corner of the Serpentine Garden. Its flowers are tiny, but of the truest blue. In warmer climates (zones 7-10), pimpernel is commonly used as a perennial groundcover. Here in zone 5 it can only be a temporary friend, outdoors at least. I have every intention of trying this pint-sized in the winter window garden, for I think it will harmonize nicely with purple, pink and blue African violets. Platycodon . This, the “Balloon Flower,” dazzles in both bud and bloom. In bud, it resembles an inflated pillow. When the pillow bursts, a five-petalled star in the most ravishing shade of heaven is revealed. ‘Sentimental Blue’ grows no taller than 8 inches, and is perfect for massing in a cottage garden, or as I have it, atop a stone wall, between flowering quinces. This is a must-have plant for all lovers of blue things. Platycodon prefers moist, well-drained soil and full sun. It reseeds itself freely in zones 3-8. What are the blues that bring peaceful tranquility to your own beds and borders? Hostas? Forget-Me-Nots? Something else? Drop me a line in the comments section below. If you’d like to be notified whenever new posts appear at A Garden for the House, be sure to enter your email address here. Does lavender count as blue? I have huge clumps of lavender (not sure of the variety) in bloom right now. You can hardly see the flowers, though, because they are constantly covered with bumble bees! My hosta flowers are also a lavender color. 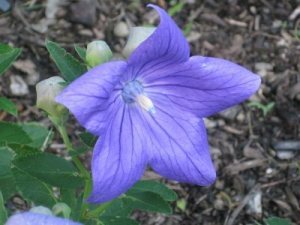 Janis – Platycodon entered my garden as young plants some years ago. I have not tried them from seed. Donna – Yes, lavender counts. My 'Mumstead' lavender is also humming with bumble bees! Curious about the blue pimpernel houseplant-experiment. Will you lift the plants, or start new ones from cuttings? 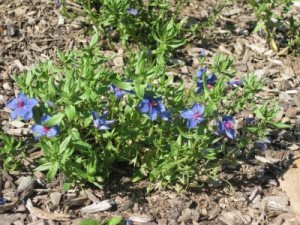 Justin – I'll take cuttings from pimpernel, and monitor its progress from roots to bloom. I suspect that it will do well indoors, in either a southern window or beneath fluorescents. Eric, I tend to agree with you, particularly about red cedar mulch. Hate it. Methinks you've inspired a future post. Royal blue is my special color from flowers to color selections in my home and personal clothing!!!!!!!!!!!! !1 Bachelor Buttons, delphinium, hydrangea, pansies,- what could be more beautiful and yes, calming. I've created an entire blue garden this year and it is my special space. I love lobelia and wish it were a perennial. Any ideas about deer-resistant blue flowers? Anne – thanks for the comment. Your all-blue garden sounds divine. 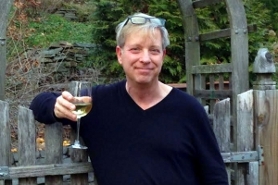 GothamDan – All of the sages are deer-, rabbit-and woodchuck-resistant, including the beautiful, annual blue salvia. Bachelor buttons, forget-me-not, squill, blue- eyed grass, Lobelia siphilitica- the perennial lobelia that GothamDan might like- and this year's acquisition, corydalis 'blue heron'! Bachelor buttons are like the ideal bridesmaid, so beautiful and yet they always manage to make other flowers near them (the “brides”) look even more beautiful! BBI – And Spanish bluebells, too! 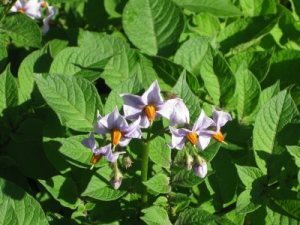 I recently started a colony of these in my Woodland Garden. 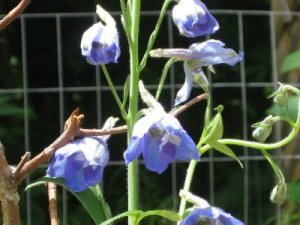 Wow, I did a search myself for blue flowers last year and decided on balloon flower and Columbines. I had bachelor buttons, morning glory, and blue pimpernel seeds given to me so I'm growing them too. Unfortunately I didn't give the columbines the cold treatment they need to bloom first year, and the hakone double blue balloon flower seeds were mislabeled and I got pale purple single ones. So none of my choices worked out. 🙁 The columbines I chose were Swan Blue & White, Spring Magic Navy & White, and Blue Barlow. Flying Saucer is the morning glory which is also blue & white fyi. Blake – nice to “meet” you. Few things are more annoying than mislabeled seeds/plants. Last fall I bought 5 BLUE phlox subulata and set them before a hedge of dwarf purple lilacs. When they bloomed this spring, the flowers were not blue, but pink. Boy did my blood boil. All those columbines you mentioned are beautiful. Try winter-sowing the seeds next time — this method never fails with columbines.